I first put on Sumari while I was driving through the Catskills in New York State over the summer, little did I know how geographically apropos it was. The trio on Sumari has its roots in the Hudson valley, going back over 20 years, and the inspiration of the name has something do with a series called the Seth Books, a study of paranormal experiences by Jane Roberts, who happened to be from the Albany area (just a bit north of the Catskills). I’m not sure there is anything to it, but it seemed somewhat interesting. 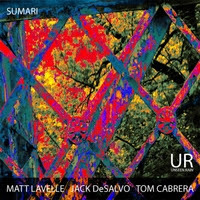 The musicians on Sumari are Matt Lavelle on trumpet, cornet, flugelhorn, pocket trumpet, alto clarinet, Jack De Salvo on cello and mandola guitar, and Tom Cabrera the dumbeq, rik, frame drums, bass drum, percussion. The number of instruments between them leads to a wide array of musical combinations. The album starts off with ’Seth Dance', and as the bass and drums get into a looping groove, Lavelle comes in on trumpet with a slightly sourish tone. The song has a hypnotic effect, the choice of timber is quite interesting, and there is an air of mystery to the track. The next track, 'Counterparts Are Comparatively Encountered’ is a bit more stream of consciousness. The track, which is the longest on the album, never quite 'takes off' however the tension that builds is quite palpable. Track three, 'Scientific Cults and Private Paranoias’, like the first, is built on a repetitive groove, however, this time, Lavelle employs a brighter tone on the trumpet and DeSalvo creates an earthy rhythmic texture on his mandola guitar that lends an exotic flavor to the track. Most engaging is hearing hear how closely the musicians listen to each other, the other tracks that follow have varying approaches, but across all, it’s the interplay that really comes through. From the modes and scales Lavelle uses, to the stringed instruments that DeSalvo chooses, to the various percussion instruments Cabrerea plays, there is a strong interconnectedness in their playing, and the mix of instruments with the free form improvisation touch on something felt rather than spoken.